Keeping it clean and lean 😀 How do you guys do it? 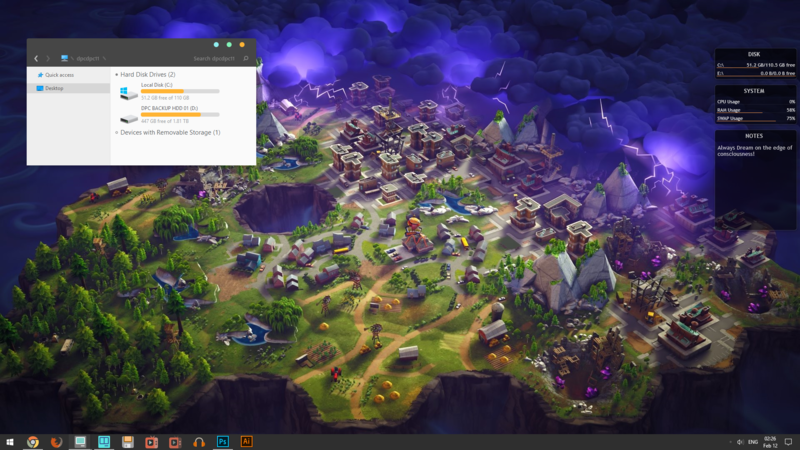 Right side widget: Rainmeter default skin. Why isn’t this the map for stone wood, it looks epic! This looks like a map from a Civilization game it’s so clean! Oh nice I like it! OMG, I had that wall paper for like a year. It’s the best Fortnite image I’ve ever seen IMO. That’s more love than the devs for this game. Take my upvote. The original Homebase map. This was before the skill tree that no longer exists. Putting points in different buildings would give you stats and unlocks. can i get the download link for the windows theme? This wallpaper is amazing. You have my upvote. But what map is this for? thanks! I love how clean it is. You guys do know that you can get this as 90x40cm mousepad, under 10€/$? I have one on my desk. How did you get the Ps and Ai icons? I used this for a very long time actually, good choice! Save the world is boring!! !